In early 2015, the Center of Medicare and Medicaid (CMS) developed the Chronic Care Management program which provides a 20-minute conversation for a non-face-to-face visit for traditional Medicare patients. The Chronic Care Management program is designed to assist providers with an instinctive way of decreasing their Medicare patients from having overnight inpatient stays. In order for a patient to qualify for the program the patient must have two or more chronic care conditions: a traditional Medicare (A&B) patient and seen by an internal or family medicine provider. A chronic condition is defined as a medical illness lasting for more than one year with treatment from a specialist or primary care physician. There are over 20 chronic care illnesses affecting 93 percent of Medicare patients. More than 71 percent of the total health care spending in the United States is associated with care for the Americans with more than one chronic condition. Six in ten adults in the United States have a chronic disease and four in ten adults have two or more according to the CDC. The top chronic illnesses are COPD, heart disease, diabetes, hypertension, autoimmune diseases, different forms of cancer, and strokes. Chronic Care Management assists providers with having a health care professional for example; PCP, NP’s, licensed social workers or medical assistants. The health care professional will set a schedule to speak to a patient who has enrolled in the program. During a 20-minute conversation, the health professional will ask a set of questions pertaining to the patient’s illnesses. If the patient is having any issues, the health care professional will send a message to the PCP or NP. Once the message is received, there will be directions for the patient to increase a medication or for patient to come in for a visit. The potential for a small or rural practice has the possibility of not only earning money for the practice, but decreasing overnight inpatients stays. The provider can earn $42.84 for a month for each patient. If the health care professional conducts 60 minutes complex call, the provider can earn $94.68. There are benefits associated with the provider-patient relationship. 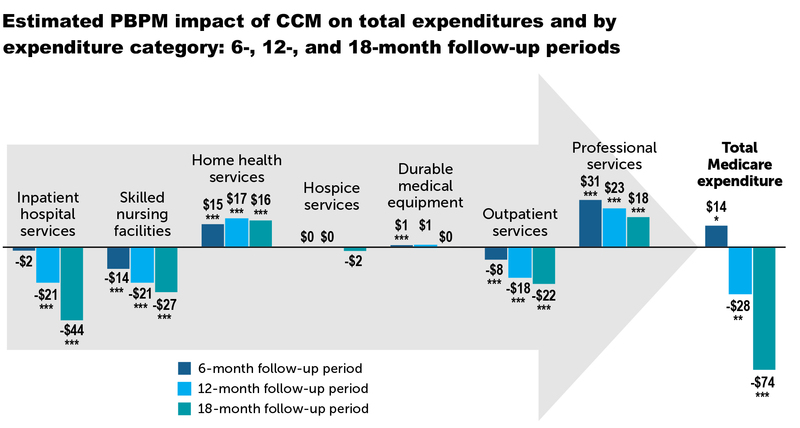 A study done by Mathematica for CMS determined there was an overall decrease of $74 in Medicare Beneficiary Spending 18 months after a patient was in a CCM panel. It’s important to note the decrease came from Inpatient, Skilled Nursing Facility, and Hospital Outpatient claims while also including an increase in reimbursement for professional services. You can find the study here. Overall Chronic Care Management will benefit you, your patients, and your efforts on the Merit-based Incentive Program (MIPS) by reducing overall costs.